Can God find husbands for our daughters?” This question was addressed to us at a home-schooling meeting in which the topic of my newly begun courtship had been brought up. And yet, this is a question for many. What is the biblical standard for our children in finding marriage partners? Is what the world has to offer in the modern dating scene our only choice, or is there a better way? Does God’s Word have anything to say about the issue? From the time I was very young my parents were praying for my future spouse. Many nights I can remember awakening to the sight of my Father kneeling beside my bed in prayer for me; for my walk with the Lord and God’s leading for my life. These sights make a deep impression on a little girl’s heart. As I grew up, there was an understanding that when it came time for me to date, that the prospective young man had to “interview with my father first”. The closer I got to this age the more serious this became. But, is that the extent of interaction a father should have in a situation as this? What was the proper way? Throughout the years the principles of courtship were brought home to our hearts through various different resources. My parents in their godly desire to protect me from the deadly temptations of the world sought for a better way. They did not want me to be subjected to the extreme pressures and snares that dating can bring. 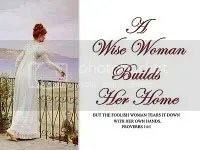 In addition to this- does a godly woman who desires to trust God with her very life need to be out “looking” for a spouse or can God providentially, sovereignly direct in bringing her a husband? I desired this protection from my parents and earnestly longed to keep my heart pure for that one for whom God was preparing me. With this as our desire, my father and I signed a covenant the summer of 1992. My father committing to protect me from unqualified young men and I in response desiring to follow the Lord under His authority in this area of courtship. These convictions had been forming for quite a while and were to continue to deepen. During the next couple of years outwardly it seemed as though there was not much happening in regard to this area. In fact, when I looked around, the possibilities for a husband seemed to be very few and there were many times that I was tempted to distrust and despair. Yet, I knew that this was the right path and I could trust in my Heavenly Father. Indeed, unknown to us, God was at work in a mighty way. For God was in a marvelous way bringing His perfect will to pass. Miles away in a town in North Carolina there was a young man who also earnestly desired the Lord’s direction in the area of marriage. Steven had tried the modern dating practice, only to find it full of disappointments and vanity. In his heart he yearned for a better way. “There must be a father somewhere desiring to protect his daughter”, was the thought of his heart. He prayerfully sought the Lord for direction in his life. Meanwhile, unknown to Steven, a close friend of his also looking for a spouse had heard of our family through two different sources over a period of a couple of years. This friend decided to write my father to request permission to correspond with me with the intent of marriage. Knowing the importance of such a decision, my father requested that he might get to know this young man better via correspondence. This eventually led to a visit to Texas on His part and several personal meetings. All of this was unknown to me. When Steven found out about it and that his friend was corresponding with a father regarding his daughter, his heart was overjoyed, as he saw indeed there was another way. Throughout the course of the time my parents spent with the would-be courter, it was determined that there was not that fitness between the young man and I that was so essential in a marriage. This young man earnestly desired my best and the Lord’s will. He very graciously understood my parents decision in not allowing us to meet. In fact, while he was in Texas, the Lord was impressing upon his heart the tremendous like-mindedness between our family and Steven. He went home with a burden upon his heart for his friend to inquire unto my father. I will never forget the night in which my parents told me of the courtship inquiry of this first young man. How my heart was filled with excitement at the thought of the Lord bringing forth someone I had never even met from halfway across the country, to inquire about me. And even though it had not worked out with this particular young man, I knew God could and would work if it was His good pleasure concerning me. I knew there was a possibility of another inquiry from this young man’s friend, but greatly desired my heart to be at rest with the Lord’s will. I waited patiently for His timing and remained patiently sleeping in this area, until He was pleased to awaken me. It was truly my desire to remain as neutral as possible that I might keep my heart only for that one that the Lord had for me. Steven’s friend did return home and came to him strongly urging him to write to my family. After much prayer and contemplation, he did indeed inquire of my father regarding courtship, trusting his steps unto the Lord. Upon receiving the letter, my parents sent him a response consisting of about 25 questions concerning himself, his beliefs and walk with the Lord. These were questions that my parents and I had sat down and composed due to the seriousness of these steps. They were very serious and weighty questions and I knew that they could possibly scare him away, yet, this was of such great importance that they were altogether necessary. For how can two walk together except they agree? I also could be assured that if this was the one that the Lord had for me, He would give him the diligence to persevere. Again, during this waiting period was a time in which I needed to lay my heart before the Lord, knowing that He was indeed in control. It was an exciting time and yet I wanted to rest in His will. Steven responded with a 90 minute audio tape, which my parents listened to. I did not listen to it, (although my parents shared his responses with me) due to the desire to remain “unattached”, for even with the hearing of a voice the heart can go out. To my great surprise, my parents were very encouraged with his responses. My Father then called Steven and spoke with him by phone for 2 hours. At this point the groundwork was nearly laid and my parents felt as though they knew him. They invited him to come to Texas to personally meet them and if all went well, to meet me. Steven had just taken time off work and did not know if he could come until fall. (This was June!) But, it was left that he would see what he could work out. This also was a time of soul searching for Steven as this was a setting of his feet on a path in a more committed way than a dating scenario. For the next few weeks correspondence was exchanged between my parents and Steven. My mother wrote a long letter to him “ from a mother’s heart”, she said. In the letter she shared with Steven about me, my likes, dislikes, hobbies, interests and those things that were dear and important to my heart. And so, even though we were not having direct communication we were learning more about each other every day through the correspondence he and my parents were having. One evening in June, Steven called my parents to say that the way had opened up for him to come two weeks from that evening. We were all delighted and eagerly looked forward to the day. The arrangement was that my parents would pick Steven up at the airport and spend a few hours with him. If all went well, they were planning on bringing him home for dinner which my sister and I were to prepare. In my heart, I still knew that it would have to be the Lord for it to all work out and so I really desired to remain neutral. I knew that my parents desired the very best for me, and wanted to protect me. They knew me better than anyone else and what I needed and desired in a husband, and so I knew I could rest in their wisdom. For had not they diligently, and lovingly raised me, caring for me like no other could? The first thing I noticed as they stepped out of the car, was Steven’s big smile. I timidly and very nervously went out to greet them. My little brother had already run ahead and made himself quite comfortable with the situation. As I walked outside, my father introduced me to Steven and Steven to me. I responded with a quiet “how do you do,” and then hastened back to stirring my spaghetti. As I finished dinner preparations, I noticed my little brother had immediately claimed his place upon the lap of my inquirer and was enjoying hearing the story Steven had started to read him. Throughout the evening, my nervousness began to abate and we had a pleasant time as a family together. We ate dinner, took a family walk, and ended our evening with family worship. The next day (Saturday) was again spent as a family getting to know Steven. But it was on the Lord’s Day, as again we were as a family, that we saw more fully our like-mindedness. As we would each share what was dear to the others’ heart, it became very apparent how fitted we were each to the other. Steven was to fly home that Monday. So, on Monday morning my father and Steven had a meeting together. These Monday morning meetings were to become a regular part of our courtship and hold a special place in the hearts of my father and Steven. Before their meeting, though, my father asked me privately if I would like him to give Steven permission to begin courting me. I told him that I felt that that would be fine. Before Steven left that afternoon, we both had about an hour together outside (under the full view of all ), during which we spoke on some areas that were each very important to us. As Steven left that day, we both were overwhelmed and full of wonder. We had fast become friends, and parting was difficult. In my heart I was filled with awe. It was apparent that the Lord was doing something. And yet, I wanted to be sure I was following the “Lord’s” will and not my own. Steven began writing and calling often after that. In our first conversation, via the telephone, we both agreed that our desire was that our courtship would be based upon the things of the Lord and not of the flesh. We desired our relationship to be spiritual first and not solely emotional attraction. For the feelings often come and go, but the things of the Spirit are lasting and the sure foundation. We knew that our question needed to be, “Could we serve God better together than apart?” And so therefore, much of our conversation centered around the spiritual, and in this way we were able to see the heart of the other. Those next few months were full of much prayer for direction and leading. Having never been through the courtship process before, we had many questions as we went along as to the “next step”, but the Lord faithfully led us. What a blessing it was to be under my parents and to see Steven’s desire to be under them as well. How thankful we were to be able to ask of them and rest in their wisdom and direction. Those courtship days will always be sweet to our memory. Because of the emphasis on the family in the courtship process, my family grew to love Steven as one of them. When the phone would ring, everyone wanted to be the first to talk to Steven before me. 🙂 It was a blessing to see their delight in my courter. We spent many, many hours on the phone together, and then I would delightfully share with my family (who were eagerly waiting) of our conversation. Steven came for weekend visits frequently, as well. We all knew the importance of not being unchaperoned, in our desire for a relationship of purity. My family greatly enjoyed serving us during that time, and accommodating our courtship in this way. For example: a picnic on the lawn and a candlelight dinner for two, complete with corsage, boutonniere, and a personal waiter (my father). Those were indeed special times as my whole family, and Steven and I enjoyed God’s working in our lives. For me, it was a very searching and sobering time as well. Entreating the Lord, that “His” will and not mine be done. Throughout the time of courtship, the Lord made it increasingly clear that He had brought us together. He who brought Eve to Adam, had indeed seen fit to place us here together, to walk hand in hand in this earthly pilgrimage. 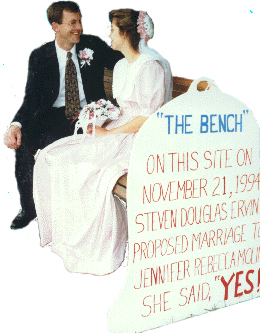 On November 21, 1994 Steven proposed to me, after consulting with my father. What a blessed time that was, as we confirmed before each other that the Lord had brought us together. Both families were overjoyed. We were married before the Lord and a wonderful company of family and friends on April 28, 1995. It was a wonderful time of rejoicing. It is such a blessing to have our story to tell our own children as we prepare to encourage them in seeking God’s choice for a husband/wife. Would we do a few things different now? Yes. But, overall our commitment to purity and involvement in our children’s lives remain the same. Over the years the concept of “courtship” has now become very popular. For some, the term is merely a name for glorified dating. For others taken to the point of almost an arranged marriage. We believe the biblical model involves much trust between parents and their now grown children. A heavy hand will not draw but push away our children’s tender hearts. Therefore a coming alongside our children (as my parents lovingly did) in guidance is the optimal. No two courtships will look alike as no two hearts are the same. We wanted to make one clarification as well…As parents, to rest in the Lord does not mean passivity. As our sons and daughters get older we will be actively looking with our sons and daughters for their spouses. It is our duty to help establish them in life, so will be active in “scouting out” eligible young men and women. We are thankful for the paths our parents took with us, and we hope to build upon that foundation in the lives now of our own children. What a beautiful courtship story! As first generation Christians who came into marriage after experiencing years of “dating around” and divorce, we desire a different path for our children. Our daughters have each signed covenants with their father (in the presence of our pastor) and your story is as close to the ideal as we have read. I will share this with them today. Thank you for posting this! Thanks for the encouragement, Cheryl. May the Lord be glorified through what He has done! I love your story! “Our” story is nothing like this but I am hoping for our daughter to have one much more like yours! Thanks! How wonderful to have a father that prayed for you like that, that you have a story so lovely, and that you see the Lord’s leading in all these things. I also like that your heart was for the protection your father provided for you, too. I hope my children appreciate our prayers for them. I sure appreciate my mom’s prayers, too. “Being married to your best friend is a delight and joy.” AMEN! I am so thankful that the Lord gave me that, as well. I wish I hadn’t wasted time with another relationship in which neither of us were sure we actually could envision marrying the other. The Lord still blesses with such mistakes, but how much greater the blessing when you have protection and great discernment… and are friends first, not “in a relationship”.